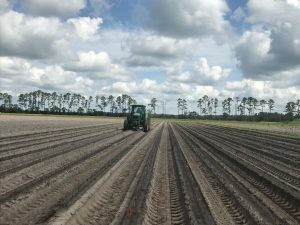 Growers in the Tri-County Agriculture Area (TCAA) which includes Putnam, Flagler and St. Johns Counties are certainly familiar with the potato crop with nearly 20,000 acres of cropland devoted to tablestock and chip potatoes. It’s no secret, however, that the once booming potato industry in the TCAA is diminishing because of increased shelf-life of potatoes grown in the Midwest and increasing freight costs for our growers. 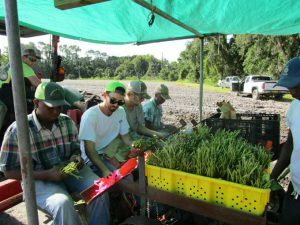 To increase the economic sustainability and competitiveness of agriculture in the TCAA, the UF/IFAS Hastings Agriculture Extension Center (HAEC) has been conducting numerous research trials on suitable alternative crops. In the past year, HAEC has experimented with artichokes, broccoli, brussels sprouts, cauliflower, sweet corn and sweetpotato. This year was the fourth season that HAEC has conducted fertilizer rate trials on four different cultivars of sweetpotatoes. 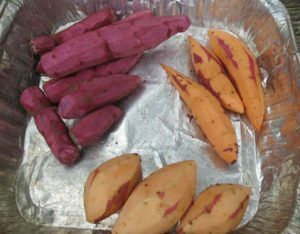 Sweetpotato (Ipomoea batatas L.) is an alternative crop that offers nutritional advantages, versatility, and easy integration in the potato cropping sequence. It is in the Convolvulaceae or “Morning Glory” family whereas the Irish potato is in the Solanaceae or “Nightshade” family, and they are literally as different as night and day. Sweetpotatoes, unlike potatoes, can only be grown in tropical to subtropical regions, and they are planted using slips, or vine cuttings, rather than seed potatoes. Potatoes are generally planted in the winter and require 90 days for maturity. 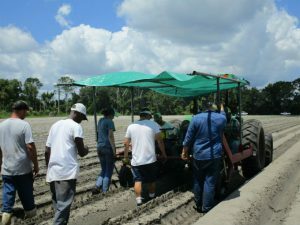 Sweetpotatoes are planted after the potato harvest in the Spring and they can be harvested anywhere from 120 to 180 days after planting, depending on the cultivar and the desired size grading. The sweetpotato crop is an attractive choice because of its high productivity on low-quality, arable lands and minimal demands for fertilization and irrigation. Sweetpotatoes require less than half of the nitrogen as potatoes and they have lots to offer in regards to versatility. The starchy root can be used as a nutritious addition to your dinner plate or converted into biofuel (i.e. ethanol) to help power your vehicle. Nearly all of the ethanol generated in the US comes from corn, but sweetpotato certainly has great potential to become a biofuel producer for tropical regions such as Florida https://www.sciencedirect.com/science/article/pii/S0926669016306823?via%3Dihub. 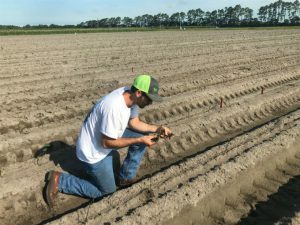 In June 2018, UF/IFAS assisted L&B Produce, a subsidiary of Singleton & Sons Farms, in a one-acre trial growing 13 different cultivars of sweetpotatoes. The dominant cultivar is a unique purple-flesh sweetpotato variety that was bred by Dr. Janice Bohac of Charleston, South Carolina. Farm owner, Steve Singleton, is a potato chip grower for Lays Potato Chips and his sons (Lane & Brett Singleton) are responsible for L&B Produce. A contract agreement has been established between the L&B Produce and Putnam County Farm-to-School Program to procure the harvested crop in late November or early December. 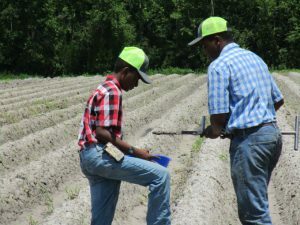 This is an exciting opportunity for farm kids to grow food for their school peers and educate them on the beneficial qualities of this sweet and starchy root. 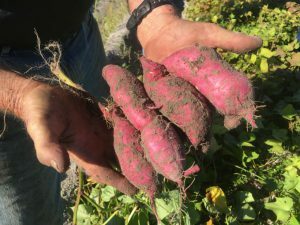 The 13 cultivars will represent a colorful variety of yellow, orange and purple-flesh sweetpotatoes that will become a nutritious addition to their school lunch plates, just in time for Thanksgiving. Special thanks to UF/IFAS Agriculture Extension Agent (Dr. Wendy Mussoline), Putnam Farm-to School Coordinator (Todd Crowley), HAEC staff (Gary England, Scott Chambers, David Baggett, Trey Craig, Cory Moseley, Lane Greene, Lance Tilton and extension interns George Laibl and Taralee Hines for all the hard work in making this project become a reality. 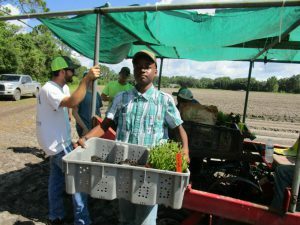 UF/IFAS helped by making the initial connection with Farm-to-School, providing labor and equipment for pre-plant preparations and planting efforts, and providing educational opportunities for the growers willing to experiment with a new crop.